Many of us would love to live by the sea, and while more often than not it becomes a bit of a pipedream, there's no reason it can't come true one day. 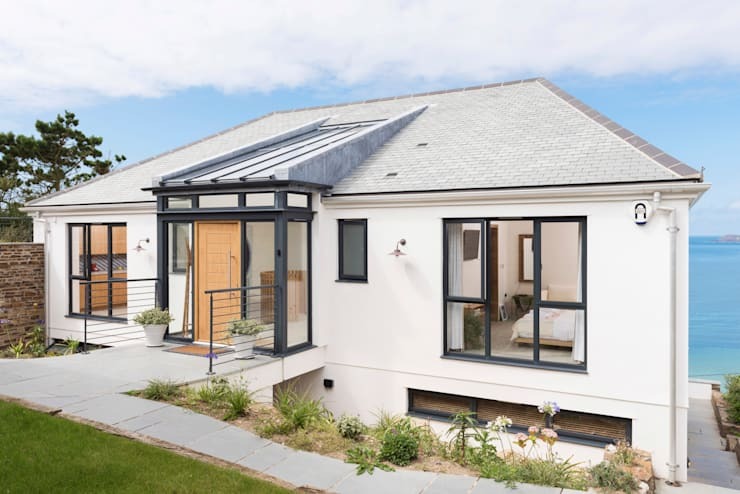 A house like this beautiful creation from the professionals at Laurence Associates is even more special than the average; situated overlooking the ocean and designed entirely to be at one with its landscape, it truly is one of a kind. The good news is that while many of us haven't turned out sea-side dreams into a reality, we do have the ability to get lost in a home like the one we're about to explore, and dream that one day we might call it out own. A simple but beautiful walkway leads us to the entrance of the home. A thin strip of garden and lower ground level separates the walkway and the house, shaping it perfectly. The green of the plants stands out against the white of the walls and the grey-black of the frames around the windows and front door, creating a very balanced but striking facade. You can already see the large skylights, which douse the entire home in natural light for the duration of the day. To finish off, a grey tiled gable roof protects everything wonderful that's waiting for us inside. This is an entrance that you just want to walk into, but you don't stop until you reach the other side of the house, where you can relax with a drink in your hand on the veranda. The entrance/hallway is very open, thanks to the large windows surrounding the door. It lets in efficient sunlight and the mirror against the wall reflects it, making the space feel even more open. The wood of the door, decorative peaces and piece of wood (which functions as a divider) adds to the calmness that was created by the white walls. The pot plants add a touch of nature to the front of the house, while the sea adds it on the other side, creating a lovely sense of balance. A living room is a space that should not feel crammed in. This is usually the room where you entertain your guests and if everybody sits on each others laps, there isn't enough space. This living room doesn't have that problem, though. The space is so big that the lounge set almost disappears. A soft off-white colour is used to paint the walls, which blend in with the cream lounge-set. A metallic arch-lamp brings in some light, but the glass windows and skylight provides sunlight during the day. At night you can either stretch out on the balcony or the couch and enjoy the beautiful starry sky. A giant striped carpet, a low coffee table, a shelve next to the couch and a wall mounted shelve and some plants round off the room perfectly. For more ideas on living rooms, have a look at these: Luxurious Living Room Designs. 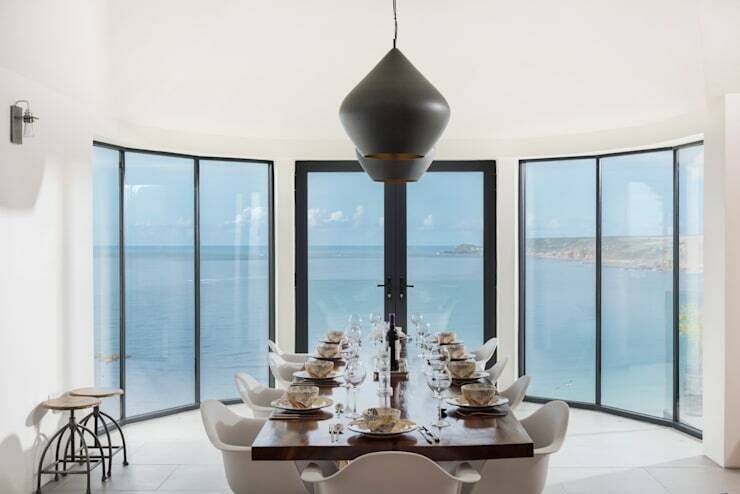 The bow window, complete with opening patio doors, has set the scene perfectly in this designated dining nook and we don't know how much food appreciation would really go on in the face of that view. 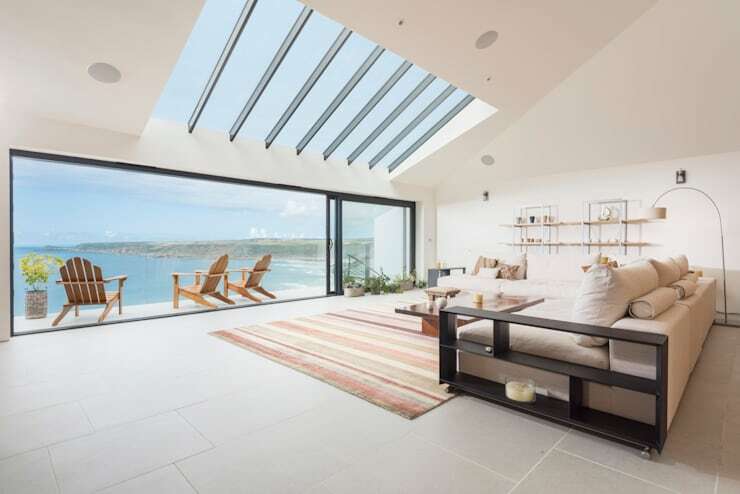 The bright blue of the Cornish coastline almost becomes the design scheme, leaving no option but to opt for a crisp white to reflect it. With dark casements and accessories, the contrast is absolutely perfect. Not that we ever seek to find fault with properties that we feature but this looks to be one without flaw. From picture perfect views through to inspired interior finishes, we are starting to feel a little more than just envious! 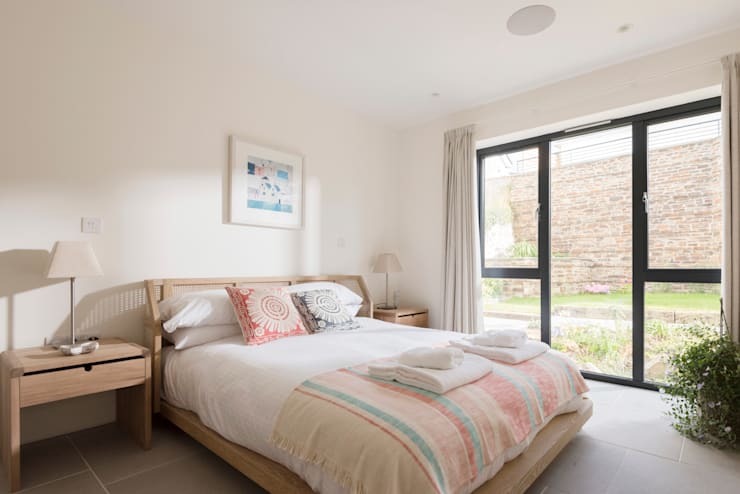 Just like the living and dining room, the bedroom painted in an same off-white colour, which makes the room look bigger than it would have with darker walls. The white bedding add to this illusion, while the pop of colour in the throw and scatter cushions create a dynamic space. The light brown wooden bed and bed side tables, help to bring tranquility into the room. Polishing it off are the sunken lights in the ceiling, two bed lamps and the big windows, which illuminate the room at various intervals throughout the day. Do you like this house? Which room is your favourite? Let us know!